Hello everyone, and welcome to the last week before Christmas! I'm off work now until the new year, so I've been a busy bee getting some photos taken for the blog, as blogmas got a little bit derailed didn't it! We were very kindly sent some lovely dog biscuits from Alison and Welly at Wellybix; one of our favourite small businesses. They have some fab Christmassy flavours, and I feel so guilty that I haven't had a chance to share them with you until now! The treats were beautifully packaged, and I loved the card with some of our dog blogging friends! "After giving up my job as a pastry chef, initially to become a carer for my mother, I am now the proud owner of Wellybix, a thriving cottage industry making dog treats! I hadn’t anticipated doing this at all, it just happened over night! My business had its grounding Christmas 2012 when I decided to bake some biscuits for my Jack Russell, Welly. It wasn’t long before I began supplying the local hotel and holiday cottages with biscuits to give to clients who brought their pets on holiday. Spurred on by the initial success, I set about formalising my business, coming up with the name Wellybix after my Jack Russell Welly-Bob and sending the biscuits off to a veterinary laboratory for complete nutritional analysis. Two-year-old Welly does his bit by ensuring baking standards are met - he is my chief tester. He waits for each batch to come out of the oven and makes sure they are up to scratch! Wellybix now supplies Pet Shops and Farm Shops in County Durham, Cumbria, North and West Yorkshire, Gloucestershie and further afield." Alison is such a lovely lady, and the biscuits look (and smell!) fabulous. It's also extremely reassuring that the products have had a complete nutritional analysis done in a veterinary laboratory, as any good dog owner will know that it's SO important to research everything that you feed your dog. I have 100% confidence in these treats, and know that they only contain good, healthy ingredients. Archie absolutely went mad for the chocolate ones, but Winnie prefers the bone-shaped cranberry variety! Have you tried Wellybix treats with your dogs? Let us know! When I posted about the dogs and their impact on my life at the beginning of the week, I didn't expect to get the overwhelmingly positive response that I got. This blog is still just a new, little space, with just a few followers, and I really didn't expect so many people to email or tweet me, expressing their own feelings and telling their own stories. It was so lovely, and I just wanted to say a little thank you to everyone who took the time to leave a comment or message me privately. It's quite daunting to share a story so personal, generally I'm not a person who shouts from the rooftops about mental illness... in fact, until very recently I denied the existence of my depression altogether. It's only once you start to emerge from the other side, that you realise the true gravity of the situation. It felt almost frivolous to go back to cute dog photos and reviews after that, so I took a few days off from Blogmas to gather my thoughts... if you follow my youtube channel, you'll probably have noticed that I took a few days off from Vlogmas, too. I'm back now though, and I have cute dog photos galore! Haha. I hope you're all well, and that you're enjoying the festive period! I'm off work for two weeks now (perks of working in a school!) so I'm hoping to go back to blogging every other day, at least. Hi everyone, hope Monday treats you well! I've got a personal post for you today, about how having dogs has changed my life for the better. I feel like that first photo maybe should have been of Archie, as he's my "first born" (lol), but the one of Winnie and I is just too cute. In April of this year, I was in a bad place. I'd been working in a job I hated for 9 months, with long hours, negative energy around me and very little free time to unwind. I felt totally stuck in a rut. I'd spent 16 years at school, college and university... and for what? I wasn't using my brain at all in that particular job, just keying in numbers all day long, and I felt completely worthless. I was also really struggling with graduating from university the previous year; I missed my friends, I missed studying and I even missed deadlines! Combined with moving home from uni and feeling like I almost didn't "fit" at home any more, I was in a bit of a state. All of this added up to a feeling of despair, a quarter-life crisis I suppose. It all came to a head when I began to get ill; I don't know if I've ever mentioned it on this blog, but I actually suffer from Crohns Disease. In the grand scheme of things I'm very lucky... I can often go years without a serious flare up, though I do have days where it'll suddenly strike, and I'll be wiped out for a day or two. It's primarily (for me, anyway) triggered by stress, and my horrible job was definitely causing me a lot of stress. I'd had to take a handful of days off work (4.5 in 8 months, to be exact) and they decided that was enough to haul me in for meetings, refuse to pass my probation, and make me feel totally inadequate. Studies suggest that those who are chronically ill, are the least likely to take time off sick... we're desperate to prove ourselves, and not let anyone down. If I ever take a day off, you can guarantee that I've been feeling awful for a while. I even went into work when my limbs started to swell up (another, lesser known side effect of my illness), and I could barely walk! To add insult to injury, several people in my team had taken more time off than I had, but I was the only one facing any "consequences". Don't get me wrong, for the most part I really liked everyone on my team, but the whole situation just wasn't fair. I couldn't work there any more, and my GP signed me off with stress. It's a cliché phrase, but I sank into a deep depression. I've suffered with depression and generalised anxiety disorder since I was 8 years old, but this year was one of my lowest points. Depression can make you do impulsive things, and one day whilst browsing the internet (I was actually looking for a thrianta rabbit!) 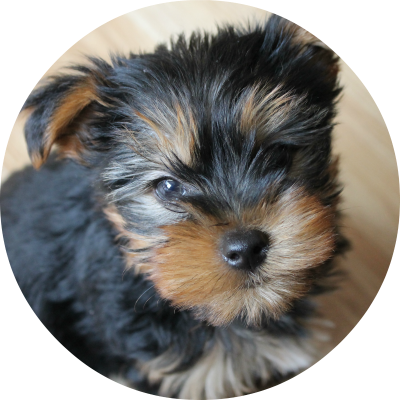 I came across a litter of yorkie puppies. My brain told me I had to have one. In order to do so, though, I would have to finally move into the house that my boyfriend and I had been renovating for the past year. He already lived there, but I had decided to hold off until it was done, as I can't stand mess and disorder. Not any more, though. I had to have a puppy, and I had to have one now. Like I said... depression can make you do impulsive things. I found the litter on a Thursday, we viewed them on the Saturday, and by the following Wednesday I had collected Archie and moved in with my boyfriend. My life changed irrevocably overnight! I was still unemployed at this point, though I did have some money saved up that just about tided me over until I started working again in September. When I look back on this time, I feel so, so sorry for my boyfriend. He deserved more time to get his head around the fact that I'd be moving in, especially after living there alone for 6 months. He never wanted pets either, but I'm afraid that comes with the territory if you're dating me! I won't lie to you... this past summer was really, really hard. Moving in with Will so suddenly didn't do us any favours; despite already being together for 3 years, it's definitely true that you don't really know someone until you live with them. In those first few weeks with Archie too, and later again with Winnie, I had many moments of thinking "what the heck have I done?!" Now though, with perspective, a new job that I'm so much happier in, and being in a great place with my boyfriend, I can honestly say that these two little dogs have changed my life. Getting Archie in May gave me something to get out of bed for. Getting a dog inspired us to start selling dog bandanas on etsy. I'm fitter than I've been in years, thanks to long walks in the woods and over fields. I've learnt that contrary to what I've often worried about, I'm definitely not selfish, and I'm capable of being a good parent. Basically, I want to be the person that my dogs think I am. They think I'm pretty great. Morning everyone, and Happy Friday! 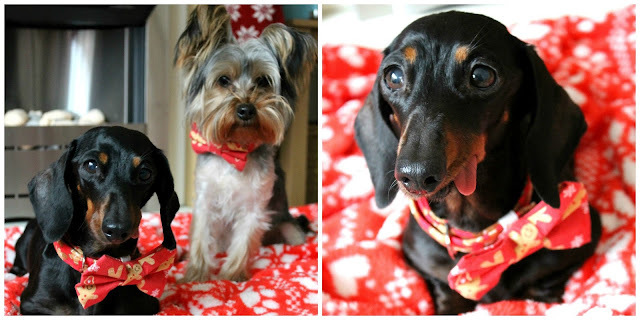 Today I thought I'd share some photos of the doggies in their Christmas bow ties, which I bought last month from Mabel & Mu. I had some gingerbread collars from Fur N Fabric, and these gorgeous bow ties look SO cute on them! They were so reasonably priced, and this particular fabric is lovely and sturdy. 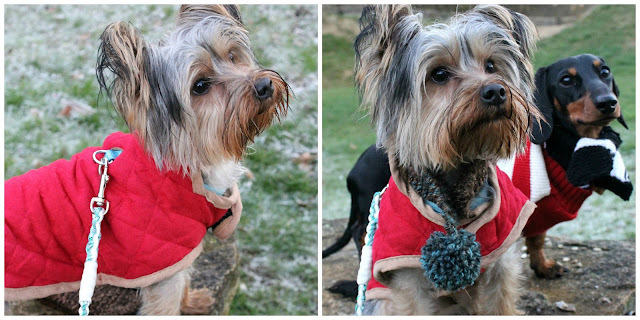 I also ordered a different winter design for Winnie which she's worn to death, she wore it to the Christmas Market yesterday too! I will definitely be buying more from Mabel & Mu in future, as the dogs need more everyday bow ties... I honestly used to laugh at people who dressed up their dogs; if only I knew then what I know now! Are you a bow tie fan? Thankfully, we have a lovely little daxie friend named Bernie who we go on weekly walks with, and both Winnie and Archie love him (a totally novelty in this house... Winnie hates any dog who isn't Archie, or a fellow Dachshund.) Meeting Bernie and his Mum has been such a lifesaver for me, as not only do the dogs have a friend to play with, but walks are much more enjoyable for me with an extra pair of eyes to look out for potential issues (read; other dogs, cyclists or joggers!) and someone to chat away to. Plus... we get super cute photos of our little trio. 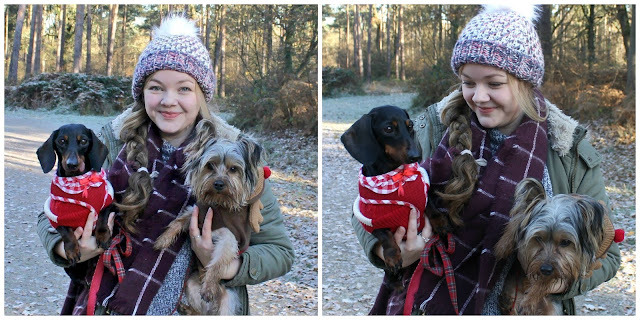 We're hoping to take Winnie and Bernie to a Christmas market tomorrow: I'd normally take Archie too, but he doesn't like crowds! I feel so mean leaving him at home, but I know he'd rather have a playdate with my parents' dogs anyway. 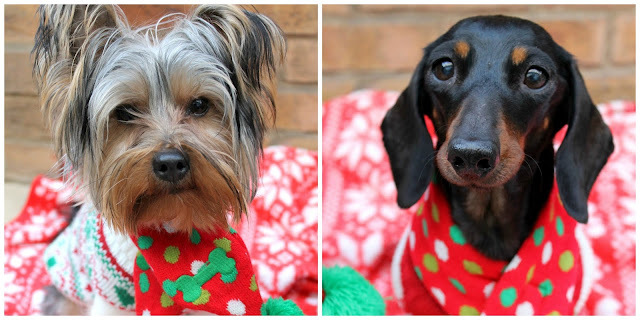 I'm hoping to get some Christmassy photos of the dogs, and will share them here if I do! Do you have any tips for stopping your dog from barking? I'm back today with some more gift ideas! Sorry to bombard you with so many ideas all in a row, I just figured they'd be more useful to you at the beginning of the month. This time, I'm doing a little shameless promo for my own etsy shop. I had a quick look back through the blog before sitting down to write this post, and although I mentioned it here and there, I've never actually dedicated a post to my etsy shop. My little corner of the internet, Chloe Suzanne Designs, started in July as a way to make a little extra money whilst I was off work. I sold stationery and planner bits and bobs primarily, and that was that. However, my mum is a bit of a whizz with a sewing machine, and she wondered if I might sell a few bandanas for her that she'd made. 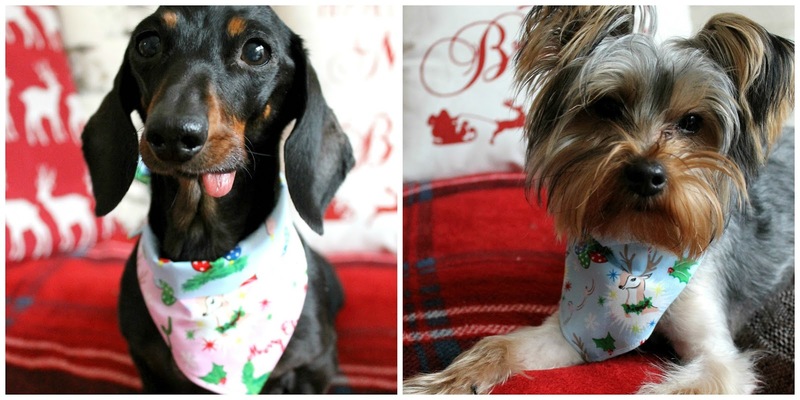 Soon, the bandanas became our most popular product! We've had quite a few Christmas designs so far this year, with new ones being churned out all the time. In these photos Archie and Winnie are modelling my favourite his and hers fabrics (sadly now out of stock) but I'll include some photos of designs we had/have in the shop! My mum is honestly fabulous at making these... they're beautifully stitched and personally, I think they're fabulous quality. They've all been tested on our own dogs (we have five between us, all different shapes and sizes!) and I'm so proud of the little business we're creating. 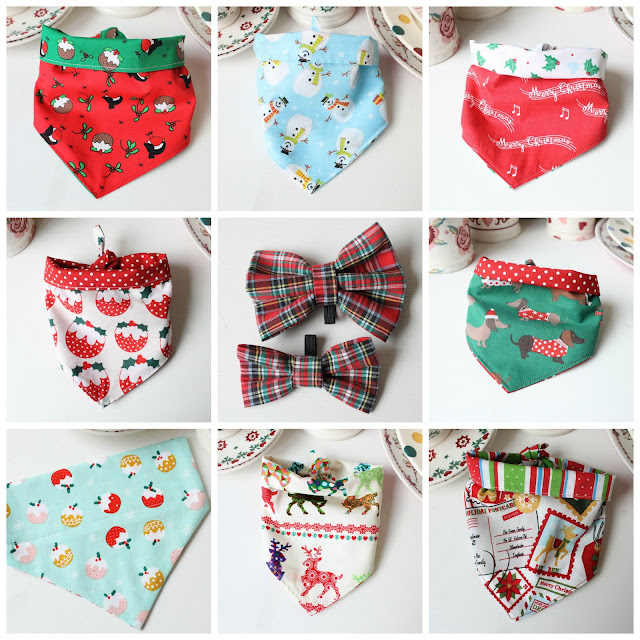 We still have lots of Christmas bits available, and I'd love if you'd go and take a peek. All orders placed in December will come in Christmassy packaging, and they'll be posted first class so that hopefully they'll reach you quickly! I'm also offering my readers 15% off with the code BLOGMAS, to say a big thank you for supporting both my blog and shop. 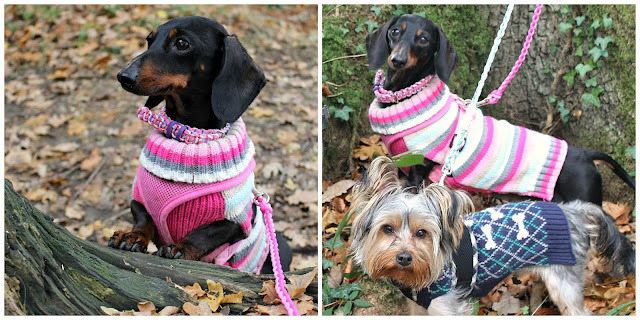 Today we're writing another little Christmas gift suggestion post, but this one will focus entirely on a new Etsy shop, run by our friend Emily and her gorgeous doggies, Colin and Rhapsody. 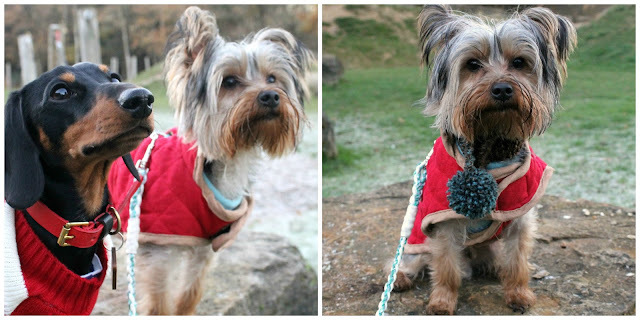 Devil Dood Designs sells high quality paracord collars and leads, and they've recently launched Christmas hampers too. The hampers look absolutely incredible, and Mum is super sad that she doesn't have enough pennies at the moment! "For anyone that doesn’t know, paracord is one of the strongest materials available for making collars. It has a breaking strength of 550 lbs, these accessories are made to withstand even the strongest dog. Paracord is also fantastic in that it is machine washable. No messing around with hand washing or special cycles, just chuck your accessories in with your muddy dog towels and then leave to air dry. These collars are built to last. I made Colin his first one nearly two years ago now and it still looks as good as new!" I wanted to include all these photos of the dogs actually using the collars/leads out on a woodland walk, as personally I love to see how items look "in action". It's hard to see Archie's collar because of his fluffy little head, but Winnie models hers beautifully here and I think you can see just how fab they look on. I love both styles (Winnie's is adjustable, Archie's isn't) and I think they wear really well.The fact that the items are machine-washable is a huge pull for me, as well as the fact that Emily has such a huge range of colours and designs. The prices are so reasonable, the quality is fabulous, and they'd make a perfect gift for the dog in your life this Christmas. We already have a little list of things we want to order next! Let me know if you make a purchase!